Well, how are all of you getting along these day? (sic) Just fine I hope. Thankful that I can still say the same for myself. We’re really having some nice sunny spring weather here lately. 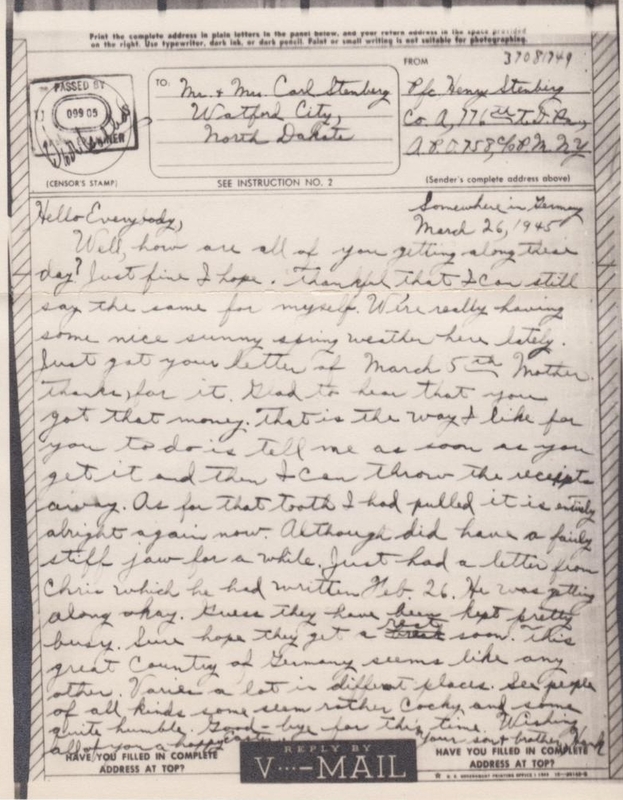 Just got your letter of March 5th Mother. Thanks, for it. Glad to hear that you got that money. That is the way I like for you to do is tell me as soon as you get it and then I can throw the receipts away. As for that tooth I had pulled it is entirely alright again now. Although did have a fairly stiff jaw for a while. Just had a letter from Chris which he had written Feb. 26. He was getting along okay. Guess they have been kept pretty busy. Sure hope they get a rest soon. This great country of Germany seems like any other. Varies a lot in different places. See people of all kinds some seem rather cocky and some quite humble. (sic) Good-bye for this time. Wishing all of you a happy Easter.